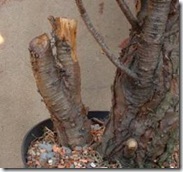 Deadwood on bonsai in the form of jin or shari adds an effective feature to a design and in the case of many old Pine and Juniper, a very realistic one as well. Jins on trees in nature are normally created when branches are broken by strong winds, by the weight of snow or by lightening strikes. A natural feature of many mature coniferous trees is that the lower branches dieback, shaded from the light by the more vigorous upper branches. As these branches rot away, all that remains are short stubs of deadwood. When styling a bonsai, branches that are not required as part of the foliage mass can be used to create jin instead of attempting to encourage complete healing of the trunk where the branch has been removed. 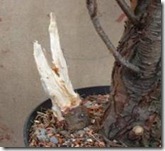 The use of jin on a bonsai implies to the viewer an increased age and shows the struggle of the tree to survive. Unfortunately, though the process of creating a jin is straightforward, its design can be difficult. A successful jin must look natural, it must look as though it has been created by nature in order to compliment and not detract from the tree. A common way of creating a jin is by carving using power and hand tools; the successful use of either takes a great deal of skill, particularly if the wood is featureless, as in the case shown below. This series of photos is intended to show an additional method of creating jin. The deadwood feature on this tree is created by tearing away at the wood to mimic the action of a broken branch; pulling away strips of the grain to create a natural effect. 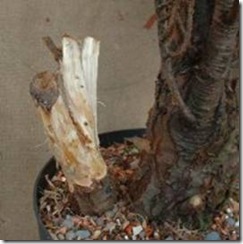 These techniques can also be applied when creating jin from branches down to 1/2" in thickness; they are however intended only for species that have fibrous wood. This includes nearly all coniferous species but only some deciduous species. (Jin and shari do not suit many deciduous species; however they are often seen displaying uro/hollows). 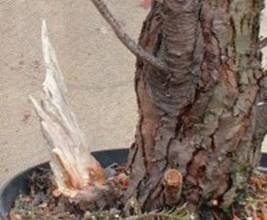 The tree used in this series is an old Chamaecyparis that has had a secondary trunk removed. The purpose of jinning this trunk is to create an effect of an old, dead stump that will compliment the main live trunk of the bonsai. 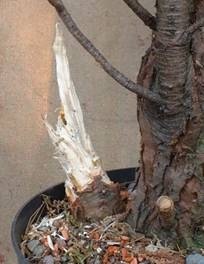 The foliage on this secondary trunk was removed and the trunk chopped two months ago and it is now starting to dry out. It is approx 2" thick at its base. 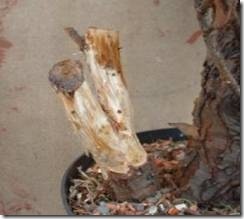 The first step is to remove the bark from the portion of wood that is to be jinned. Any remaining soft tissue/cambium is also removed. 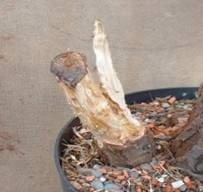 At this point only the part of the stump that is above the soil level will be worked on; further work will be carried out as the stump is revealed after repotting in the future. The first slithers are pulled away from the stump; the top of the wood is either notched to segment it or crushed with pliers. Each segment is then pulled down and away from the stump with jin pliers or ordinary pliers. 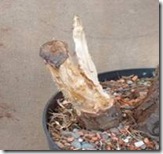 When pulling away strips of wood, it is important the live section at the sides or the base are not damaged. Strips rarely stop abruptly above the live wood and often need removing near the base with a knife or similar. The pulling down of the segments of wood continues on the first half of the stump. 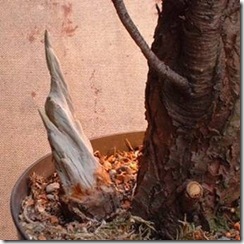 The second half of the stump is then pulled away; it is starting to reveal more of a natural shape. Unfortunately, the current shape resembles a catapult and it is decided to reduce the second half of the stump further. 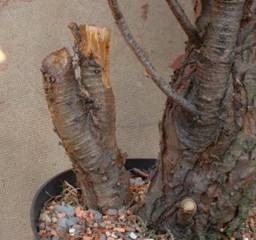 After reducing the second half of the stump; now the jin is really starting to take shape. Increasingly smaller strips of the grain are now pulled the length of the stump, creating more texture to the wood. As the wood is fibrous, small burrs and pulls are evident. These are best dealt with by gently burning the surface of the wood. A naked flame is run over the surface of the trunk to burn off the fibres. It is very important at this point to protect the rest of the tree, in particular the foliage, from not only the flame but also the heat that it generates. 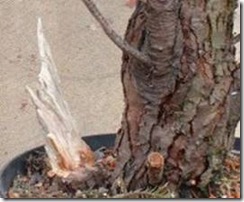 In this case, a piece of hardboard was used to protect the tree from the flame. It is also important that the jin itself is only slightly scorched to remove the fibres otherwise it is possible for the jin itself to set alight! Any blackening of the wood is easily removed by the process of smoothing off and lime-sulphuring. In this picture, the jin has been lightly carved with a small gouge to accentuate its lines and it has been gently sanded down with sandpaper to smooth out any tool marks. Sharp edges are also rounded off to replicate the effect that the action of the weather would have on deadwood in nature. The following morning the lime-sulphur has nearly dried and the work is complete. 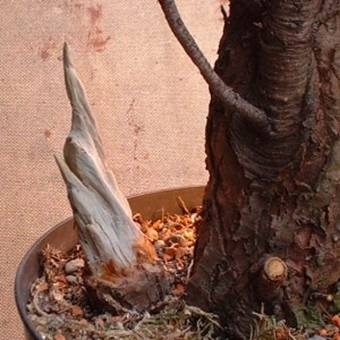 In the future, when the tree itself has been styled, the jin will be further refined to ensure it compliments other areas of deadwood on the bonsai as a whole. For the time being, it will now be left to dry and weather naturally.